How can a Scotch brand that’s only been around for five years suddenly offer a 33-year-old single malt with a $3,000 price tag? In the case of Craigellachie, the answer is easy. They’ve been making third-party Scotch under contract for more than a century, but only recently released a product with the Craigellachie name. In 2014, the brand debuted with three single-malt Scotches of different ages: 13, 17 and 23 years old. All proudly bore the Craigellachie banner and now, the old Speyside distillery from 1891 has put a very small amount of 33-year-old Scotch into circulation. As you know, Scotch this old won’t come cheap, but let’s get away from price for a moment and concentrate on process. Craigellachie (pronounced kray-GAL-eh-kee) does a few things in production that gives its Scotch a signature meaty quality and “muscularity,” as the company likes to put it. Firstly, Craigellachie uses worm tubs during distillation. Where most distilleries prefer shell and tube condensers, which expose the alcohol to far more copper, Craigellachie’s worm tubs minimize copper contact. That means more sulfur retention once the alcohol vapor is transformed back into liquid. It’s the residual sulfur that produces the Scotch’s meaty, muscular core, putting it in a heavier weight class than your typical Speyside spirit. There are only a handful of distilleries left that still use worm tubs. But before distillation, Craigellachie oil-fires its barley in the kiln during the malting process. This also adds to the Scotch’s robust character. It also spent more than three decades in Bourbon hogshead barrels and Sherry casks. Exact time frames are a trade secret, but nevertheless, what’s left is a quirky, delicious Scotch that has plenty of cerebral refinement to balance out its brawn. Specifically, some sweeter elements of tropical fruit, marzipan and honey. And then there’s that distant smoky note of an autumnal bonfire in the background. Of course, a Scotch like this is best paired with a cigar that’s structurally similar–and there are plenty. The first cigar that comes to mind is the La Flor Dominicana Andalusian Bull (Cigar Aficionado’s 2016 Cigar of the Year). Like the Craigellachie 33, this Dominican cigar has a wild strength tempered by an elegant sweetness. The A.J. Fernandez New World Puro Especial Toro from Nicaragua (ranked No. 12 cigar of 2017) is another great pairing. It has an awesome core of power balanced by layers of caramel notes. Anything from the Padrón Serie 1926 line or Cuban Partagás letter series (Serie D, E or P) will have the same effect. 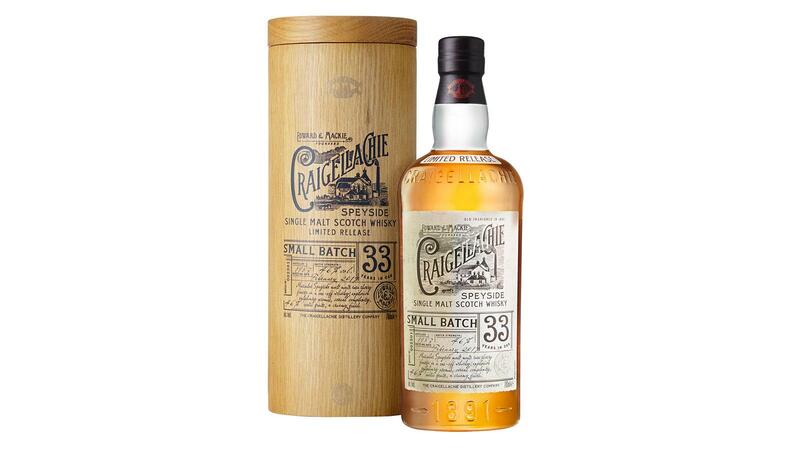 The $3,000 price-tag might be steep—you’re paying roughly $1,000 per decade—but Craigellachie 33 fully delivers the levels of complexity and cohesiveness that can only come from a Scotch that’s spent a few decades hibernating in a barrel. In the spirits world, time costs money and there’s really no way around it. The Craigellachie 33 is part of Dewar’s Exceptional Cask Series and, by extension, part of Bacardí’s huge portfolio of spirits. Should the 33 prove unattainable, there’s always the Craigellachie 13. It scored 90 points in our sister publication Whiskey Advocate. The 13-year-old won’t give you the ethereal sophistication of a Scotch 20 years its senior, but it’s made in much the same way and will still give you an idea of how Craigellachie does things differently.